The Steering Committee of Pakistan’s National Coalition on Media Safety (NCOMS) endorsed on 8 October 2013 the UN Plan of Action on the Safety of Journalists and Issue of Impunity and issued a comprehensive ‘Islamabad Declaration’ outlining a set of action items and recommendations for key stakeholders on combating impunity against journalists in the country. Pakistan’s Federal Minister for Information and Broadcasting Pervaiz Rasheed was guest of honour at the meeting in capital city Islamabad where key media stakeholders, including journalists, media houses, civil society, parliamentarians and national and international media support organizations, attended the Steering Committee meeting. The Islamabad Declaration covers three main categories of stakeholders and their proposed action items – media sector actors; state institutions and political parties, and civil society. It suggests ways and means the stakeholders will need to collaborate to fight the impunity of crimes against journalists and media in Pakistan where six journalists have so far been killed in 2013 alone and over 60 in the last 6 years. Pakistan has been selected by the UN as one of the five pilot countries where the UN Plan of Action on the Safety of Journalists and Issue of Impunity will be implemented to stem the killing of journalists. The other pilot countries include Nepal, Iraq, South Sudan and Mexico. “A democratic country cannot be pluralistic and progressive if its media remains a target. The newly elected government believes that for development to be sustainable and for institutions to strengthen and consolidate themselves, freedom of expression and right to information need to be protected,” Minister Pervaiz Rasheed addressed the first meeting of the Steering Committee. Words of support for the UN Plan of Action from the federal government minister were also echoed during his speech. “The [Pakistan] Government supports the efforts of United Nations and its partners in Pakistan to combat impunity against journalists to keep them safe, particularly the implementation of the UN Action Plan on Impunity against Journalists,” the minister said. “If journalists cannot be safe, media cannot be safe and journalism cannot be professional. We will work together to keep our journalists safe and our media free and professional,” Pakistan’s federal minister for information and broadcasting went on to add. NCOMS should endeavor to bring onboard all key representatives of the media industry and allied stakeholders on the issue of Freedom of Expression (FOE), Right to Information (RTI) and media and journalists safety. A National Charter of Media Safety should be developed by NCOMS listing roles and responsibilities on initiatives relating to media safety. A set of “Safety Protocols for Journalists” should be developed by NCOMS outlining minimum safety standards and procedures, based on best practices on safety for media practitioners. The “Safety Protocols of Journalists” should be endorsed, adopted and implemented by all members of media representative associations that are members of NCOMS and hire journalists and media workers. The charters/constitutions/manifestos of media organizations, including PFUJ [Pakistan federal Union of Journalists], APNS [All Pakistan Newspaper Society], CPNE [Council of Pakistan Newspaper Editors], PBA [Pakistan Broadcasters Association] and RBA [Radio Broadcasters Association] among others, should be amended to make safety of journalists the number one obligation in each one of them. A “Media Legal Aid Fund” should be established to make available resources for journalists to invoke legal processes on issues relating to attacks against them to pursue justice as one of the key means of combating impunity. NCOMS should lobby with the Government and Political Parties for setting up the office of “Special Public Prosecutor” to exclusively take up and pursue cases of attacks on media and media workers to promote a culture of justice and accountability. NCOMS should collaborate with the Government and Political Parties to develop a “Model Journalist Safety Bill” that should be tabled in parliament for enactment into a law. The press clubs should be converted into resource hubs on safety of journalists providing training, tools and technical resources for journalists on safety and security. All media organizations including press clubs should take specific measures to promote the safety of journalists. All media practitioners, including individual journalists, should promote safety in digital communications. A permanent subcommittee on FOE and RTI under the existing standing committee of media and broadcasting of the national and provincial legislatures. The Government and Political Parties should endorse the UN Action Plan on Combating Impunity Against Journalists and support its implementation in Pakistan as one of the 5 pilot countries for implementation. The Government should set up a permanent office of “Special Public Prosecutor” to exclusively take up and pursue cases of attacks on journalists and media to promote a culture of justice and accountability. The Government and Political Parties at the federal and provincial levels should pass legislations on “Journalist Safety” for enactment into a law, which should incorporate mechanisms for speedy trial. The Government and Political Parties should strengthen the criminal justice system – through allocations of funds and legal resources – to effectively deal with threats and acts of violence against journalists. CSOs consider attacks on journalists, media practitioners and organizations should be considered as attacks on freedom of expression (FOE) and right to information (RTI). CSOs should introduce safety issues into the mainstream of national strategies for media development and donor funding. CSOs should work with and support lawyers and legal organisations who to challenge impunity against journalists and media through the legal system. CSOs should mobilize and generate resources for journalist training courses on safety, security and ethics. 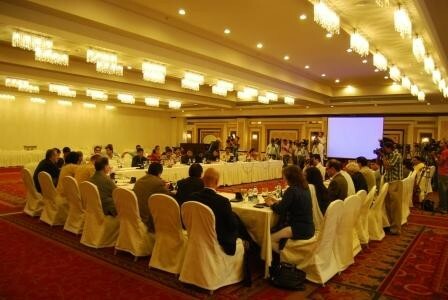 A view of inaugural meeting of steering committee of national coalition on media safety in Islamabad on 8 October 2013.